You always thought it was the idea that mattered. Hey, that’s what’s in all those startup stories. 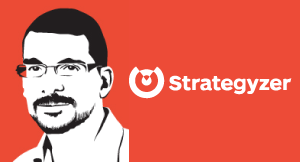 Alex Osterwalder explains how startups should explore which value proposition is right for their market and what business model will best help them bring their idea to market. In addition, as they experiment, startups will most likely revise their idea. The main thing here is to always admit that when you start out, uncertainty is at its maximum. You don’t know what’s going to work, in particular when you are trying something radically you know, and you need to admit that, which means you’re not going to execute an idea. You’re actually going to search for the right business models and the right value propositions to bring that idea to market. To turn that vision of what you think could be done into a strategic and complete blueprint. You need to admit you have no clue when you start out, but you systematically reduce this uncertainty with small experiments, and you increase the money you spend on experiments, tests, prototypes, until you have enough evidence to understand – this is going to work. And then you invest heavily, but you don’t invest heavily at the beginning which sounds you know like obvious but many companies still invest in ideas. Ideas don’t matter, is turning that idea into concrete value proposition and business models that you can prove with evidence that they are going to work. That’s the hard part, and then you execute it. The ideas don’t really matter at all. Achieving product-market fit is harder today than in prior technology booms; it’s the main challenge that SaaS startups face. Nailing down product-market fit is a foundation of lean innovation management. Be sure your product is what customers want.